But, in late 2010/early-2011 the Stephen Harper Conservatives intervened aggressively to help extreme right-wing candidate Michel Martelly become president. Six years earlier Trudeau’s Liberal predecessor, Paul Martin, played an important role in violently ousting Jean-Bertrand Aristide’s government. 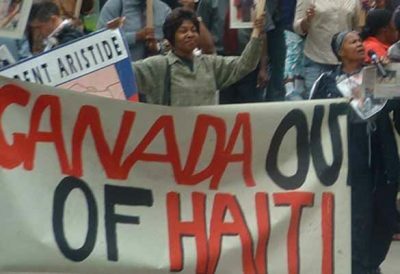 For two years after the February 29, 2004, overthrow of Haitian democracy, a Canada-financed, trained and overseen police force terrorized Port-au-Prince’s slums with Canadian diplomatic and (for half a year) military backing.